Block Party – Hey, Look! A Writer Fellow! Always be careful what you wish for. Last year, when I secretly decorated the house for Christmas (as documented in a recent issue of The Boston Globe Magazine) I was filled with a sense of personal triumph. Ha HA! I thought. The house is decorated exactly the way I like it! Little did I know that last year’s bit of derring-do would lead to a new family tradition: I am now The Official Holiday Decorator. In other words, my wife no longer cares where the carolers go. So while Ellen educated young minds and Alex nursed his post nasal Niagara Falls, I set up the village, manger, Santas, sleds, fake packages, and our ever-growing platoon of Lenox snowmen. If you send me a card with glitter on it, it’ll go in the trash before it gets out of the envelope. Merry Christmas! Long story short, decorating is a big job, but I do enjoy it. And, once in a while, a holiday decoration can create some fun, unexpected puzzle time. 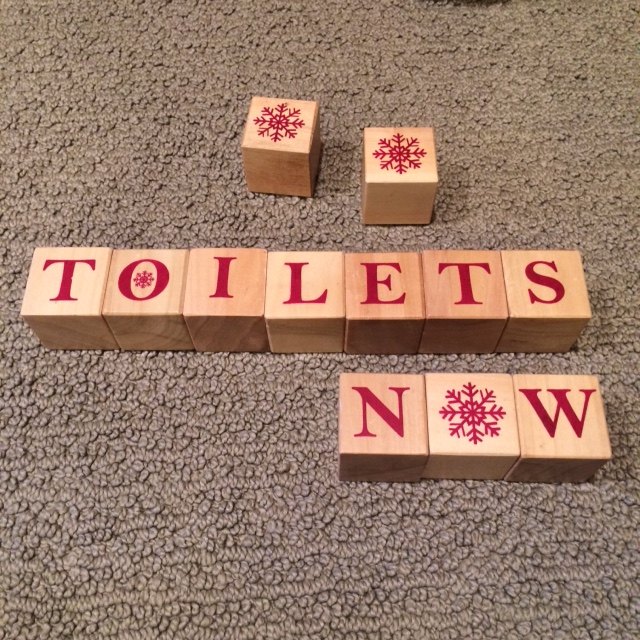 Ellen bought these blocks at a post-holiday sale last year. She packed them away before they could properly go on display so I didn’t know what they were supposed to spell. “NOEL” seemed like a logical place to start. But the end result left something to be desired. 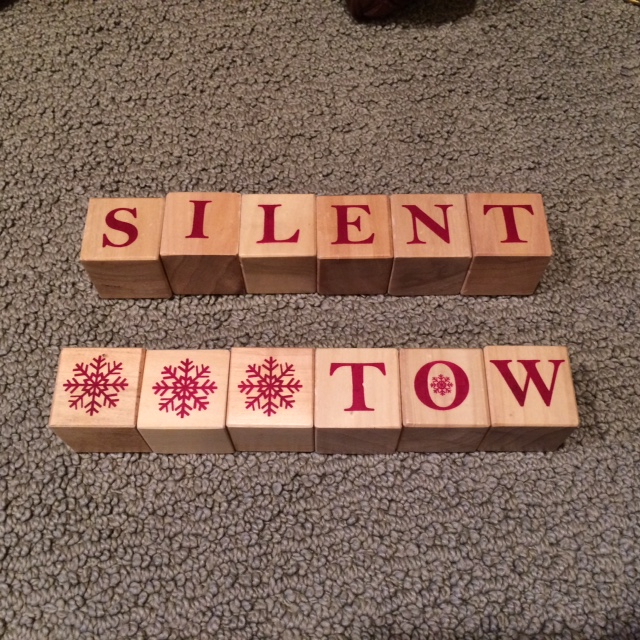 I could also spell out “SILENT.” But, what was left didn’t make much sense. It did, however, fill my brain with amusing images of a tow truck driver who moonlights as a mime. It does, however, conjure up images of a charming fishing village — like Cabot Cove, but without all of the serial killing. 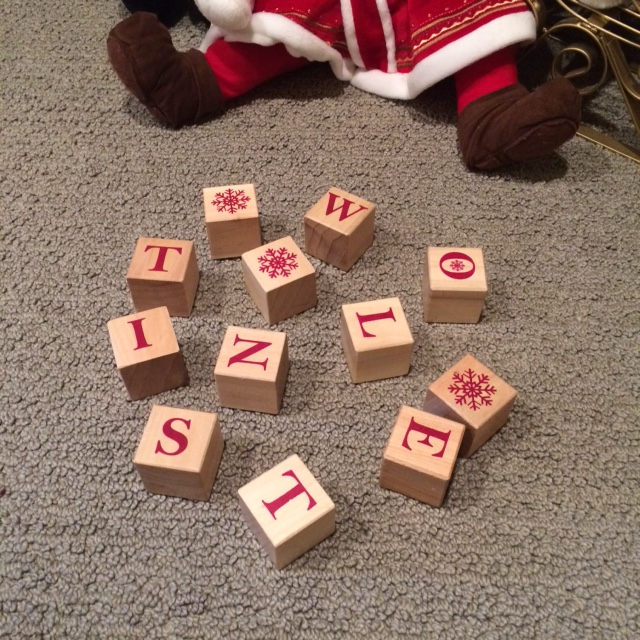 By this point I had figured out that the blocks were supposed to spell “LET IT SNOW,” but I no longer cared. I was having too much fun. Mmm! Just the way Mom used to make it! I often feel this way when I need to write an amusing blog post the morning after I spend half the night decorating the house. I better go sleepy now. And a happy holidays to you! Now that was kinda fun! Love word games. I love word games,too, but, to date, I have yet to complete a New York Times Sunday Crossword. This may become a 2016 New Year’s Resolution. Me too! I guess I’m not a scholar of any sort! That’s probably just as well for both of us. I do do the LA Times Sunday puzzle (They print it in the Newark Star Ledger) and you’re right. I can complete that one. Maybe I ‘m on the wrong coast. Clever!!! Oh, how I enjoy reading your posts every week. In this one, you got us hooked on the first line (I’m ALWAYS careful what I wish for …!! ), snagged us with the mystery of the letters, got us to chuckle with your spelling guesses, and then just gave us a warm fuzzy hug with your wit – stolen or not. Merry Merry – and THANK YOU. As usual, you say the kindest, sweetest things. And my hugs are often fuzzy. I really should trim this beard. Haha! 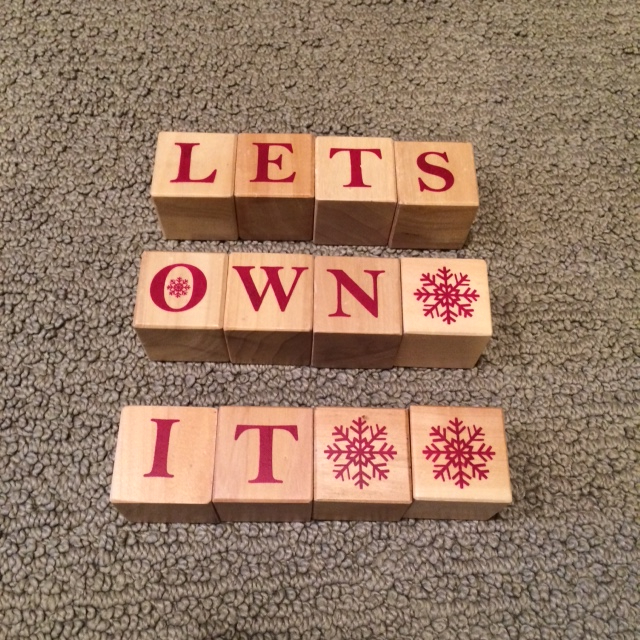 My fav is “Let’s Own It!” I love your light-hearted posts! (BTW… the tree has fallen over now for the fourth time… after adding wood shims to the base… so it is now relegated to the corner where the walls will catch it if it goes again! Can you spell “Freak Show” for me with those blocks? WTF?!!! Haha Bruce! I bought it at Costco! They actually would take it back! Reason for return? Defective? Who can’t get a Christmas tree to stand upright?! Again… WTF!!! I’ve heard that the good folks at Costco don’t ask a lot of questions before they give you your money back. Surely, they will understand that nobody bought a tree with the idea that it will lean against the wall. Another solution might be for them to sell you a Costco-packaged set of four hand saws to trim the bottom of the tree trunk. Don’t need FOUR hand saws tightly wrapped in hard plastic? Keep one and you’ll have three extra. Everyone gets hand saws for Christmas this year. Yeah, that’s the truth! Surprised I didn’t have to buy the tree in a 4-pack! They don’t remind you to give it a fresh cut either… gotta wonder how many people have trees falling over with brown needles on them as well! Could be worse! Now I feel a little better – thanks, Bruce!!! This gives me a great idea! Why not save THIS years tree and return it NEXT year as defective (“Hey, this tree got old REALLY fast!”) for a full refund. Buy a replacement tree. Repeat next year (hoping that Costco has high employee turnover and no one notices the annual visit). Four times. Amazing. Have you considered hanging the tree from the ceiling? Ha! Isn’t that satanic or something? Like upside down crosses? I’ve seen it done, but it just doesn’t seem right! Wha? No. Keep the trunk part facing down and tie the top branches to the ceiling. Since the tree is originally a pagan Winter Solstice ritual that Christians decided to adopt, Satan doesn’t really enter into it at all. But trees aren’t made out of meat, silly! If they were, mine would be eaten before Boxing Day. I was thinking of the trunk, of course, if the tree was hung upside down… would only make sense to go with a pretty heavy-duty hook to hold the weight, don’t you think?! Are you in the UK? Don’t observe Boxing Day in the states! When our youngest was little, we put the tree in the playpen. You could try that. I would have put it in the corner too. Bad tree! Stay in the corner and lean up against that wall!! Jude’s got a good point. Perhaps your tree could be like an Elf on the Shelf; it could move from room to room getting into adventures. Wow! The pack n’ play to the rescue, eh?! You sure are creative! And I agree with you – it’s a bad, bad tree! On Santa’s naughty list for sure! Haha! O** LINT STEW is definitely my favorite! 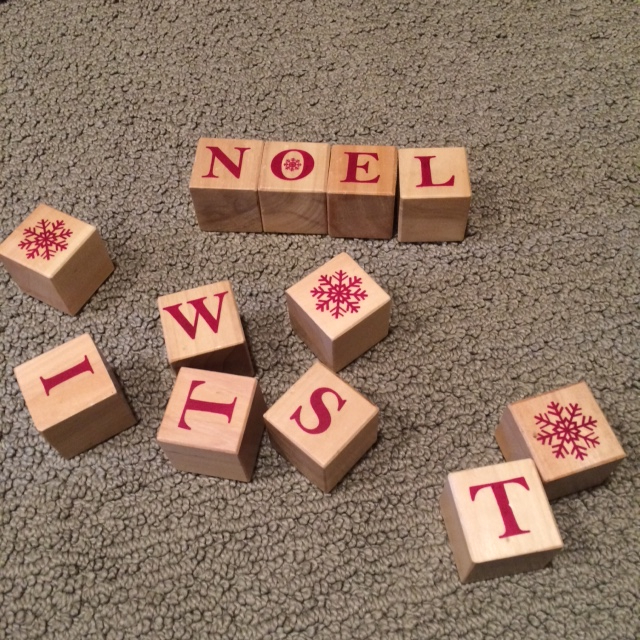 My mother had large plastic holly branches that spelled NOEL. 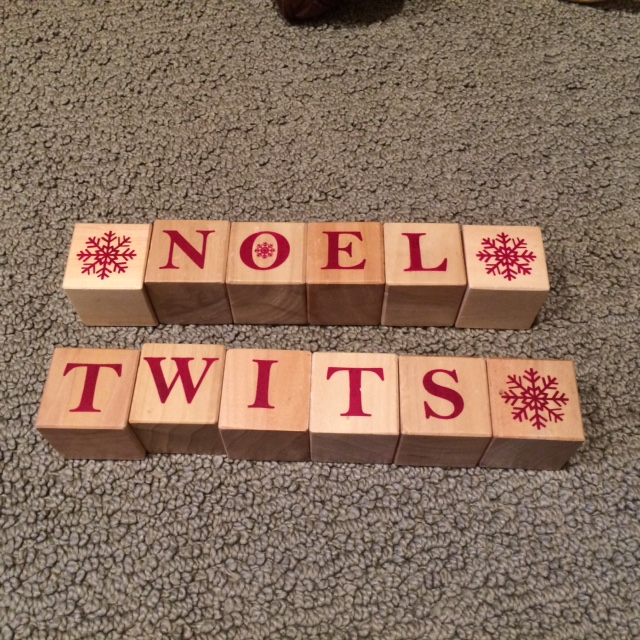 Drove her nuts that the rest of the family was constantly re-arranging them into non-words. We would have had a field day with that many letters! You should get some LET IT SNOW blocks right away, then. I came up with quite a few more than what’s picture here, including a couple of R rated options. Mike, There’s nothing like a holiday block scramble. Hope you and yours have a very Merry Christmas. And you have a joyous holiday, too, my friend! I love all these much better than let it snow, because let’s face it, snow is not all that great, really! Naw! Snow is awesome. Sledding, snowmen, yada, yada, yada. Good stuff. Good, good stuff. 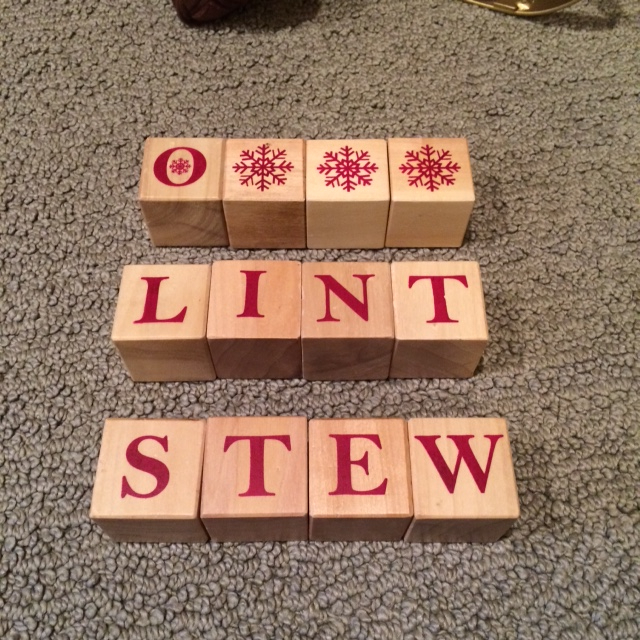 Ha, Lint Stew, a Christmas specialty that’s been delighting the masses for years. Of course, after all that fiber, Toilets Now becomes a common refrain. Yes, lint stew does go right through you. Another brilliant post by an OCD block arranger! Who knew that blocks could be so witty? So you’re giving the blocks credit. Very nice. She did have a sense of humor, despite her struggles with depression. Cheers! Actually, what I meant to say was: “You people and your scatological humor fall far outside the boundaries of good Christmas taste!” Or maybe it’s the lint stew that falls outside the bounds of good taste…. You clearly don’t season your lint stew properly. Paula Deen adds four tons of butter. Rachel Rey recommends pouring something out of a can. Guy Fieri suggests bleach and lots of hairspray. So you got a few options. Butter works for me, or bacon fat, but I’m thinking that both Rachel and Guy are talking about presidential can-didates. I’m sorry, but I already follow Cricketmuse’s blog; I cannot endure another pun-filled comment thread. So there is a limit to your punniness. Sigh. SO done with the pun. Ooh. That is a good idea! Hope your Christmas has an extra bit of merriness! 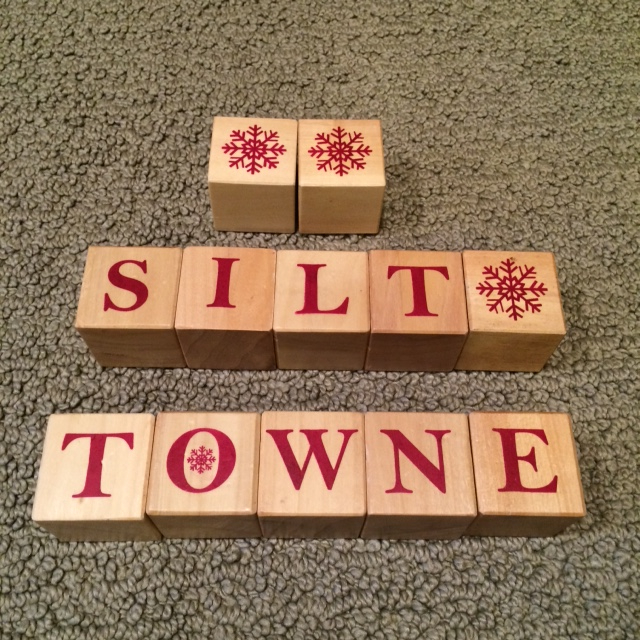 I pretty much lost it at Silt Towne. And let me tell you, hysterical giggling with sinus congestion (I had my first ‘common cold’ last week, or at least the first one I ever recall having. I usually skip straight to ‘severe respiratory infection’.) is… interesting. Oh, dearie my. I’m glad you enjoyed the post, but I think I can hear your wheezing from here. Take it easy and have a nice soothing bowl of Lint Stew. 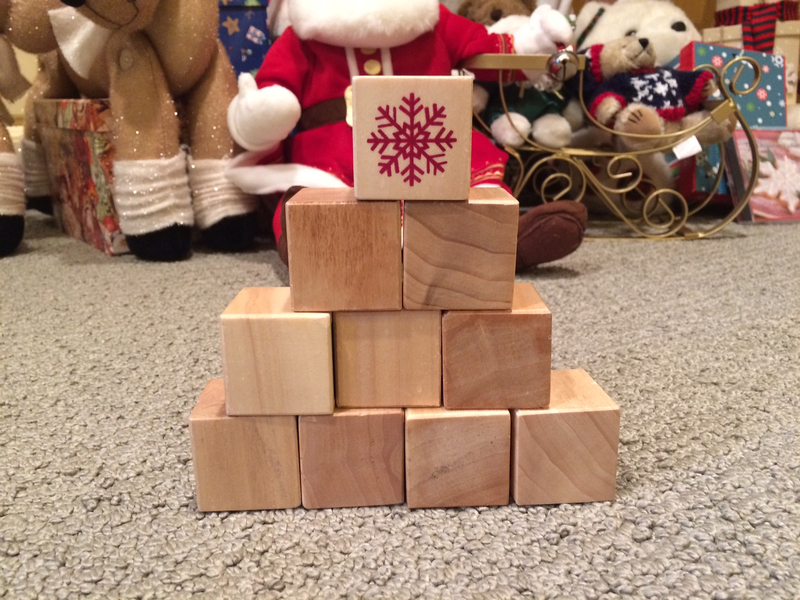 Nothing like a good set of wooden blocks to bring out your inner four-year-old. Extra points if the phrases are dirty. Oh, you are a bad boy! I’m sending some coal for your stocking! I probably deserve it. I do write for children, after all. I need a cleaner mind. I love this post. Very creative. 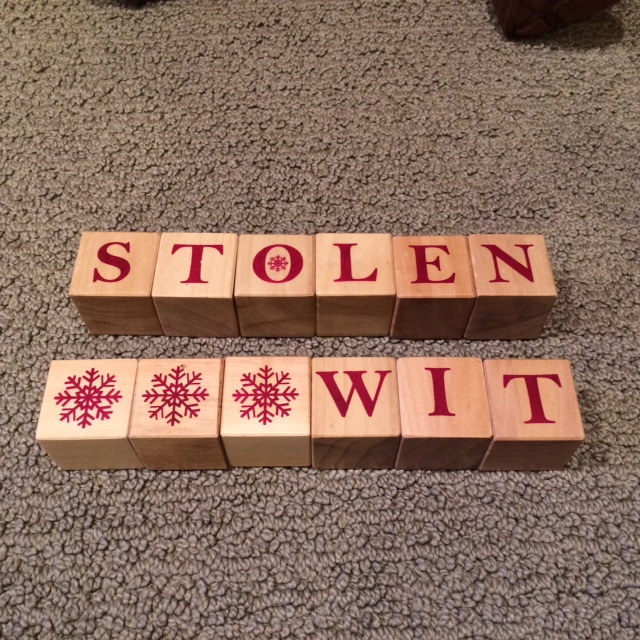 Love the “stolen wit.” Yes, I can see how this got so contagious. Oh, I was tired and punchy at the time so I was laughing like a complete dork.I also came up with a few other that I didn’t show here because, well, they were kinda dirty. Ha ha ha. These are great. There’s also Wet Tonsil. And, for the record, who on earth would want a dry tonsil? No one, that’s who. Which one did you leave up for the family? Please tell me it was Noel Twits. I rotate the phrases on a daily basis. It keeps things interesting. If anyone hasn’t discovered Mike Allegra’s blog, heylookawriterfellow, consider this an early Christmas gift. Every post is pure fun. He had me rolling this morning. Glad you liked it, Suzanne. And that’s for hanging out in my bloggy neck of the woods. Happy Holidays! I loved this and it has me chuckling away -some days just dissolve into wonderful nonsense! Have fun with the rest of the decoration. As for glitter cards, I’ve found the wrapping paper with glitter a thousand times worse! Glitter wrapping paper?! I’ve never heard of that, but I suspect it was created by Satan himself. LOL love the blocks and the messages you came up with. Thanks for the laugh. What a great way to start the day and I’m secretly laughing at you now having to do all the holiday decorating. Ellen is a very smart woman. Reminds me of my husband who is now responsible for paying all the bills. Be careful what you wish for, indeed! And also be careful of what you say. ha. Yep. I have a habit of making more work for myself. Perhaps this is why Ellen married me. Your post has left me with a great big smile on my face. I know you are taken but if you ever need another house to decorate, I could supply the blocks. What a very kind offer! And a Hap-hap-happy holiday to you, too, Tess! You are too kind, Vanbytheriver. Love your blog handle by the way. Noel Twist: rum, orange liqueur, cranberry juice. You think? Noel Twist could also be a Magi dance move. OK. This made me snort. Well done, Cricket. Well done. So if you are so done with pun I gotta come up with other means of levity. Obscure wordplay? And to you, too, Linz! You had me at “post nasal Niagara Falls.” Haha, happy holidays! This time of year I should just cork up each of his nostrils. And a Hap-hap-happy Holidays to you, too, Britt! Hey, Mike. I hopped here from Diana’s page (Myths of the Mirror), thinking you might be in my area (saw the reference to the Boston Globe). Too bad. I’m always up for grabbing lunch and chatting with fellow writers. But nice to be aware of your presence in the world. Enjoyed the post! I, too like breaking bread with fellow writers. Lemme know if you’re in the NYC/New Jersey Area and we’ll set something up. BTW, you’ve overlooked (or, perhaps, wisely chosen to omit) some other interesting options with those blocks. Drop an email if you’re curious. The correct answer is “chosen to omit.” I write stories for children, after all. Has anyone else come up with: LET IT SNOW…? Dear Writer Fellow: You being a kids’ book author and all, I’m sometimes not qualified to comments on your posts, having neither kids nor really much that’s age appropriate in my house. But I want to report that I spent 72 hours with wee ones at my house during the holidays! I learned a lot and intend to practice on your blog. For example, I now have the experience to whip out a quote from Wreck It Ralph or even Inside Out. Well, I can’t exactly remember any quotes right now, but I like your blocks a lot. I wished I’d had some when the kids were here. Then again, who knows what they might have spelled! 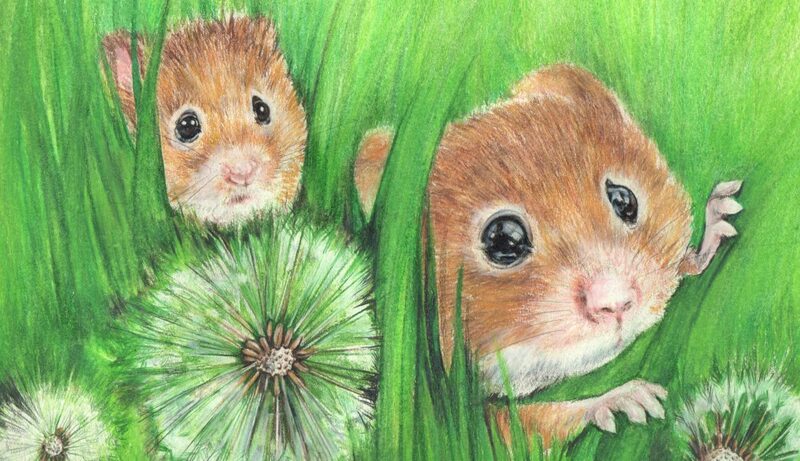 You, my friend are ALWAYS qualified to comment on my posts. When you don’t comment, a little angel somewhere sheds a single tear.